"The wealth of information that was there throughout, from woodland management, to the practical side: you never felt you weren’t getting what you needed." Mature student Mark Hall clearly recalls the elation he felt when he conquered his fears and peeped from the top branch of a towering tree across the beautiful Derbyshire countryside. Mark, 40, took redundancy from his supervisor’s job at Tesco in Alfreton and retrained as an arborist at Derby College’s Broomfield Hall. 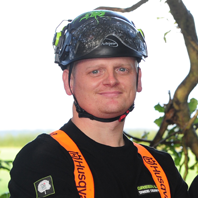 Now he and his colleague Andrew Fretwell, who also took redundancy from Tesco, have launched their own business, Green Line Tree Services. Mark gained a Distinction on his Level 2 Diploma in Forestry and Arboriculture, second only to Andrew’s Distinction. He said he gradually built confidence in his climbing skills and in using his equipment.